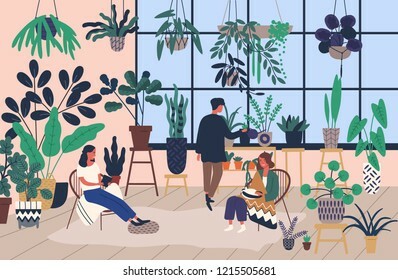 453 place | Vector illustration in rank M-rank: Group of people or friends spending time at greenhouse or home garden with plants growing in pots. Young men and women caring for houseplants. Trendy vector illustration in flat cartoon style. Group of people or friends spending time at greenhouse or home garden with plants growing in pots. Young men and women caring for houseplants. Trendy vector illustration in flat cartoon style.